Diana Corbyn (Back left) has been with the Murdoch Branch since year dot. Her interests are botany, ecology and bushland restoration. She currently represents the WSWA on the Rehabilitating Roe 8 Advisory Committee. Diana is our Branch Vice-President. Ross Young (Back 2nd left) has been a Society member for four years and a Murdoch Branch committee member for three. A former career banker, Ross completed his BSc in Environmental Biology in 2014 and now is administrator of the Mining Rehabilitation Fund. His particular interests are in plant ecology and plant/bird interactions. Jennifer Dudley (centre) grew up in Adelaide where she was an artist & designer for many years, often incorporating South Australian Native Plants & Wildflowers in her textile design. Jennifer moved to Fremantle to complete her PhD in Asian Studies (Indonesia) at Murdoch University, and always intended to roam the West looking for Wildflowers to photograph & draw, which she now does through the Murdoch Branch of WSWA. 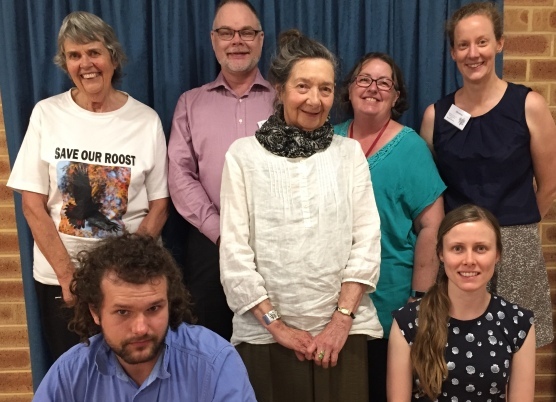 Felicity Bairstow (Back, second right) is a member of many environmental organisations and committees and played a pivotal role in the Save Beeliar Wetlands campaign. Christine Allen (Back right) has a passion for all things plants. She heard about the diversity of flora in WA during her undergraduate degree at the University of Wollongong in NSW and thought it sounded like Willy Wonka’s Chocolate Factory for plant lovers! Christine completed her PhD in flora conservation at UWA in 2014 and has continued to work in the revegetation of flora in the Wheatbelt and Peel-Harvey. Christine has been Branch President for three years now. Mathew Woods (Front left) works as a senior Conservation officer at the company Landcare Weed control. Outside of Mat’s work, he has various hobbies like playing video games and gardening. Mat also really like plants. Mat is our Branch Treasurer. Sheree Walters (Front right) grew up in the wheatbelt region of Western Australia with a passion for the environment and natural landscapes. Sheree is currently completing a PhD in native plant genetics at Curtin University working with four of our wonderful WA natives – including two parasitic plants! She is particularly interested in landscape ecology and the importance of biodiversity – including plants, animals, insects and fungi – in both natural and restored landscapes. Sheree has been our Branch Secretary for three years now. The biggest estate on earth written by Bill Gammage. Is from what I hear a fairly well known book on Australian history. The book covers the subject of Australia’s landscape before European settlement as a land systematically managed with a scientific precision to ensure abundant and predictable wildlife and food plants. Bill explains How Aborigines achieved this using fire and plant life cycles to create varied land management strategies for the same goal. The biggest estate on earth is a definite must read for people interested in Australian history and more importantly for people interested in land management. I know I enjoyed this book for that exact reason. Our Branch Patron, Alex George, has kindly compiled a list of native plants that have grown successfully in gardens around the Melville-Cockburn area for at least seven years which are considered reliable and hardy growers – many of which he has growing in his own garden! We hope that this list may provide a starting point for anyone in our area who is looking to plant natives on their patch. Enjoy! On Saturday 17 November, members of the CCWA gathered at Perth Waldorf School for the CCWA Community Conservation Awards 2018. Hosted by President Prof. Carmen Lawrence and Vice President Tim Barling, some of the most inspiring environmentalists in Western Australia were acknowledged. Brian Moyle was honoured with the prestigious CCWA “Bessie Rischbieth Conservation Award. Brian has been a quiet achiever who has shown commitment and compassion towards the protection of wildflowers in our state over several decades.